Hey so, some time awhile back on this site, I typed about how my recent videos weren't playing in Iwara's video player in "Source" quality setting for me, instead loading a black screen throughout the entire video. Viewing it in lower 560/360 resolution worked fine, and downloading the Source file from Iwara worked fine as well. No matter what browser I used the issues were the same, and I even tried both Desktop and laptop with the same problem. This was only happening to my own recent video uploads. Most other people claimed they could view my videos in Source quality on the Iwara web player just fine though, with the issues seemingly fixated on a small minority (or maybe they didn't bother to speak out). So the problem seemed to be on my (and a few select users') end, but I just shrugged and let it be since I couldn't be bothered to find out why. Now, after rearranging my video render settings, I believe I may have isolated the issue. As I had suspected, it had something to do with my video render settings. 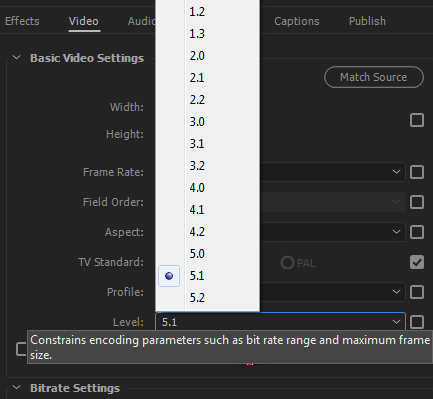 Specifically, it's related to the "Level" setting, in that the problem videos were rendered with a Level setting of 5.2 instead of the 5.1 I used in my older uploads. My most recent video I uploaded had me go back to a Level setting of 5.1, and now I can view it on Source quality in the web player just fine! Whether this is just a result of video files themselves rendered in Level 5.2, or a result of the video rendering program that i use being the culprit, I have not determined. But the video render program I use is Adobe Media Encoder CC 2017 just incase it's an issue with the program itself and not the setting. I know I'm in the minority here and this issue probably doesn't affect the majority people, but I'm posting it here for future reference and just incase the other minority of people have the same problems and can't find out why. Yes, that setting will affect who can stream it or not. These things are mostly determined by your own computer's setup - such as browsers, codecs, OS version, all that junk. On our end, the only possible thing we could do is a force re-encode. But I'm unsure if we can event detect what level a video was encoded with. I read somewhere that you should always use level 4 for streaming videos. Is that true? Level 4 or 4.1 should provide the most compatability at a slightly lower quality.